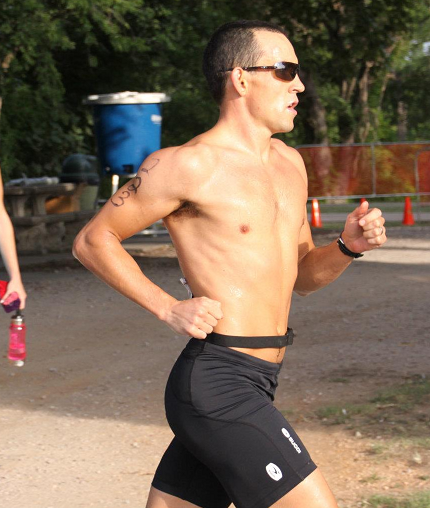 Organized by the Waco Striders Running Club, this duathlon takes place along the Brazos River in Waco. The first run is 5k along the paved river walk, followed by a short 9 mile bike, and then a 2 mile trail run along the river. A separate 5k and kids' duathlon are offered with family discounts, so you can bring the whole group! This low-key duathlon is just north of San Antonio. 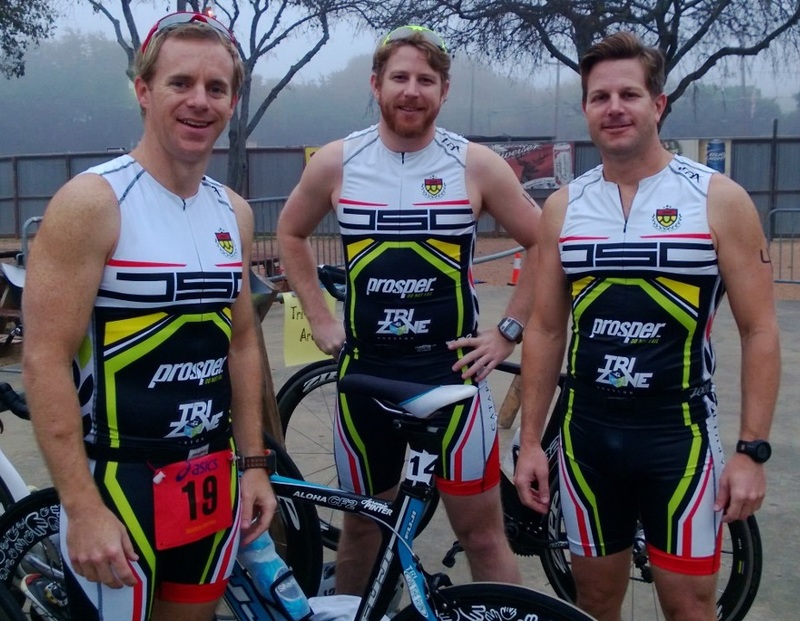 Transition is located at the Boerne City Lake Park, with a 5k run on paved roads. 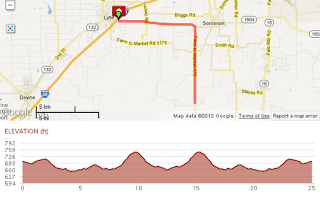 The 25k bike has some nice elevation changes on low-traffic roads. If you've done the Small Texan Triathlon, you'll notice this race shares the early part of the bike course. Now for a tough one! Hel of a Du adds a little bit of extra distance with the 3.5 mile runs, and a LOT of pain with the 26 mile bike, which features a long climb in the middle. 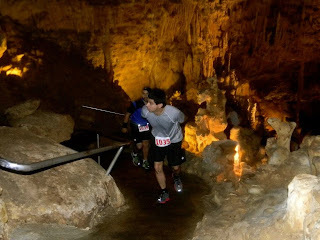 This race was started by ATC's own Adam Stroobandt and is now put on by other friendly folk from Soler Sports in Helotes, Texas. The 2011 race featured cool prizes like locally produced wine bottles. 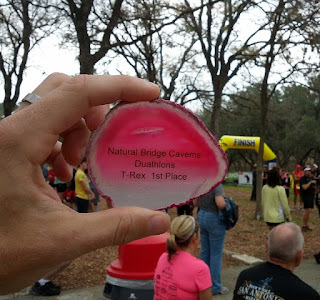 If Hel of a Du didn't tire you out, you can race the very next day at Natural Bridge Caverns. 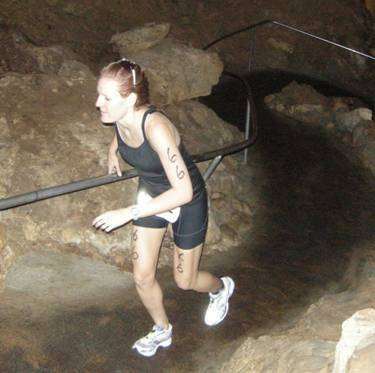 This race features a unique time trial start inside of a cave. You run your way up and out of the cave and then along a trail. The bike course features some decent elevation gain as you head back for your second trail run. Various distances are offered, from pleasantly short to gruelingly long. 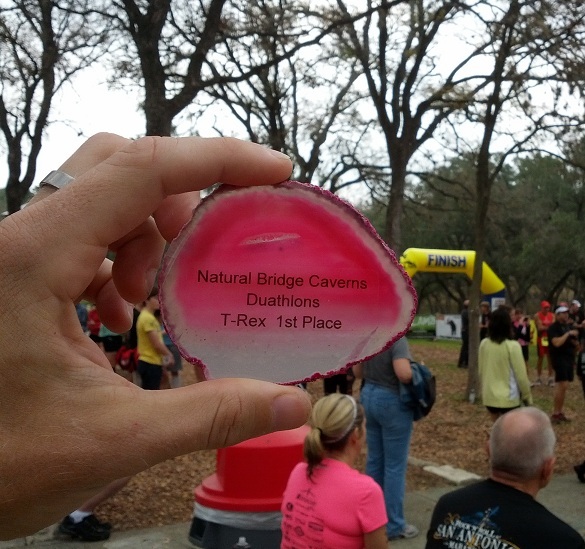 The hardest category, T-Rex, also adds a super steep segment to the first run. If you know of other Texas duathlons not on the list, let us know in the comments! November usually means it’s off-season and slowly getting back into shape with some basic strength training, running, and light riding after a few weeks off the bike. 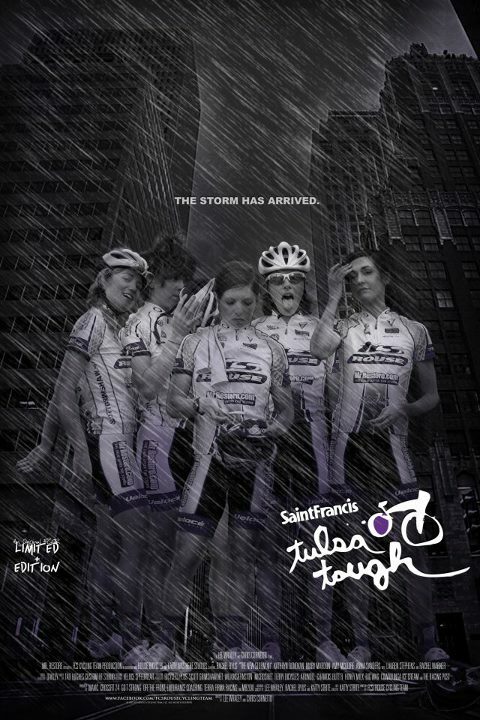 But there’s the Tour de Gruene, a late-season race and a Texas tradition if you’re a cyclist and like time trials. And I love time trials! That being said, I needed to “activate” some time trial legs for November. After closing out the season at Track Nationals I began some structured training a few weeks before with running, core/strength, and cyclocross, and had done one cyclocross race. 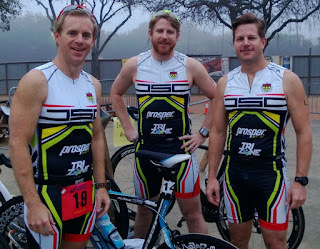 So I started riding my trusty P4 (courtesy of Austin Tri-Cyclist) a week before the TdG TT. I was trying to get comfortable and powerful in that position after a long time away from it. Five days before the TT I went down to Canyon Lake and did a couple of laps on the course to get an idea what to expect. “Pretty interesting course,” I thought. “Interesting” because it required a lot of different things in order to come out on top: climbing, navigating tight turns (including a wide 180), descending at 40-45mph, and going flat-out on the few flat sections available. So compared to your normal and “boring” 40K TT, the Tour de Gruene promoter (Will Roetzler) showed some guts by picking this course, a nice loop with start/finish at the same spot – a good improvement from last year. Race day was perfect: A “late summer” day in November, close to 80 degrees, 8mph winds and sunshine. I was there early enough to ride around for a bit, talk to some friends and athletes of mine, pin numbers and pump up a tire or two for some guys who were running out of time. After that I got on the trainer for ~30minutes and did my usual TT warm-up while trying to stay out of the sun. The start was on the top of the Canyon Lake dam so part of my final warm-up was riding up the final finish hill in my 42x25 trying to go as easy as possible and “paperboy-ing” it. I was fortunate to have a 90second gap ahead of me and also was the last rider to go off. That adds to motivation and makes things a bit easier. If you’ve got someone around you – in this case the never-boring and always entertaining moto-official Mike Gladu – you don’t have to worry about your back. The first mile was flat-out over the dam on smooth-as-glass asphalt. I aimed to keep it right at 30mph here. Then we got into the twisty, technical part: North Park Loop. For you Austin residents reading, it was basically a bit over a mile on the Veloway at full speed, including 8 turns. You can lose a lot but also gain a lot here. After that it was back down toward HWY 306 and onto some descending rollers towards Canyon Lake. I tried to push it over the little risers and let it “roll” on the descents, trying to give my legs some recovery because the really hard part was yet to come. With the right turn on FM 2673 it was 1-2 miles flat and descending towards the dam. It’s not the Tour of the Gila TT where you spin out a 55x11 and go 50mph, but at 43 it was still fun and I was trying to stay aero and not to move my legs in order to rest as much as possible before that final left turn up to the top of the dam. 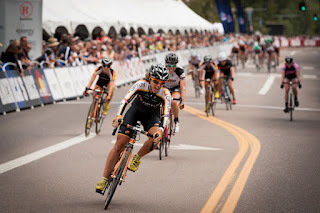 “Those last 500m hurt the most,” I remembered from last year’s race, but you can lose a lot of time here by spinning. But if you like pain and keep the chain on the 54 you gain some time. I didn’t want to risk shifting under big loads and potentially dropping a chain so I rode the 54x25 (I know, mechanics tell you different) all the way to the top. It hurt but it was satisfying to finally be on top of that damn dam! US Air Force member and fellow Texas P/1/2 racer Dan Cassidy ended up in 2nd place, while the “New Kid On The Block” Caleb Fuchs came in 3rd Overall. Thanks to Will Roetzler for another great event out on Canyon Lake with some quicker results than last year. I wonder what chip-timing would cost the individual racer for a future event? I figure it would be so much easier and quicker than manual scoring and keeping track of times, spreadsheets, etc. Just a thought maybe for 2013. And a big thanks to Austin Tri-Cyclist for supporting me with the best TT bike out there this season, a fast Cervelo P4. 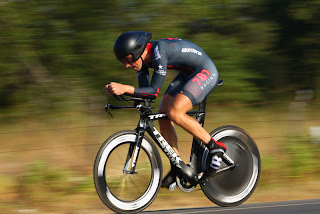 And while Wes Jerman did not race this year’s event (we won the Team TT together last year) he deserves a mention as I was riding his HED disc and Stinger 9 in this year’s TT. The P4 and HED TT gear is a winning combo anytime in my opinion. Both are available at ATC, too. The Price of Gold is history told by the victor. Marty “The Blade” Nothstein, gold medalist in the 2000 Olympic Games, is revealed as a loveable bully, an athlete intensely proud of his body and what it can do, a man who’s so obsessed with Olympic gold that he’s willing to do anything to get it. He’s ambitious, cocky, self-absorbed, aggressive, ruthless, overwhelmingly full of himself at times...and not quite apologetic about any of it. In sum, he’s a 210-pound recipe for success on the velodrome. Track racing is an inseparable mix of intimidation and muscle, cleverness, and insane speed. Unlike the bony, lean-muscled endurance athletes of road cycling, track cyclists are thick-necked, beefy weight lifters. They boast cross-hatched scars and earn nicknames like “the Outlaw” and “Bones.” In the 200-meter match sprint, two opponents stalk each other for three laps like wary bears; in most cases, the win is decided by a short and ferocious sprint to the line on the final lap at speeds over 40mph. This is Nothstein’s signature event, though he also wins championships in the keirin, kilo, and team sprint competitions and later races on a professional road team. The Price of Gold explains the intricacies of track racing in a way that’s comprehensible even to the uninitiated. Turning the pages, the reader experiences Nothstein’s progression from punk kid to world-class athlete, his cycling future shaped in part by luck and random generosity. He grows up in Trexlertown, Pennsylvania, home to a renowned velodrome incongruously plunked in the heart of farm country in 1974. When Nothstein is 14, his punishment for throwing rocks at a neighbor’s garage is to join the neighbor’s junior track racing program. There his talent is recognized, and a contingent of tough-skinned, washed-up track cyclists takes him under their wing, giving him not only the experience and training to race well, but also instilling a sense of purpose and entitlement. 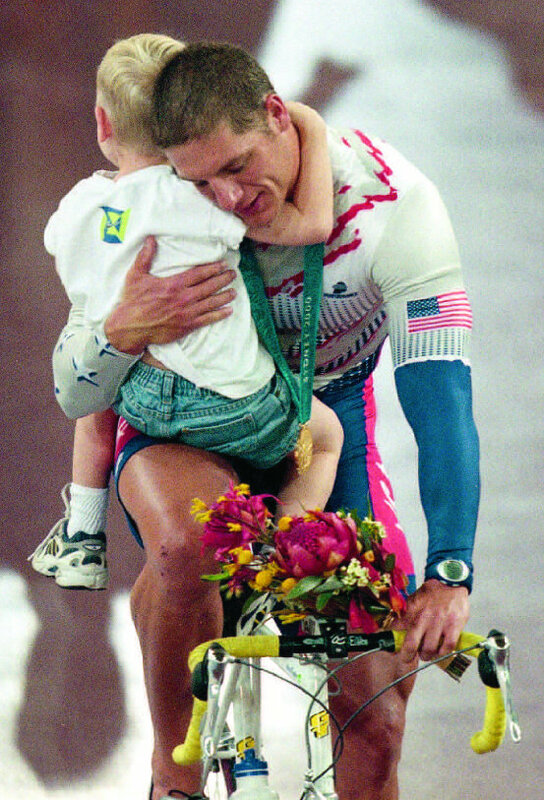 When he wins silver at the 1996 Olympic Games in Atlanta, it’s not good enough for Marty Nothstein. In the early 1900s, track racing was wildly popular in the US; track cyclist Frank Louis Kramer earned more than baseball stars like Ty Cobb. Today, the Olympics are the be-all and end-all of track cycling, its Tour de France. “The Games are the only time the best in the world come together, and everyone in the world watches,” Nothstein writes. Track racing is not unique in this regard, of course. For many sports, Olympic gold is the pinnacle of achievement. Athletes have an opportunity to compete at this level only once every four years – maybe two or three chances in a lifetime – and must perform at their best, whether they’re having a bad day, caught the stomach flu, or, like Nothstein, got knocked down on a training ride by Christian Vande Velde three days before competition. The pressure is enough to break a normal person in half. 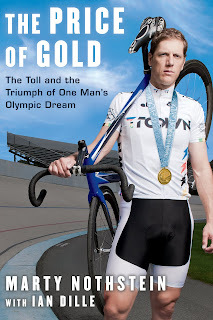 Exploring the single-minded determination and oftentimes unhealthy obsession required to be an Olympic athlete, The Price of Gold details a work ethic beyond what any sane person would deem reasonable. After his silver medal in Atlanta, Nothstein etches No. 1 into his mind. He must end his workout at 51 miles, not 50, must pump 11 gallons of gas, not 9. The narrative is almost entirely focused on Nothstein’s training and competition, only briefly alluding to his personal life, but his preparation for Sydney leaves little room for anything else. Nothstein cites the emotional and physical distance from his family as one of his biggest sacrifices. Those who might expect the airing of dirty sheets, given the ongoing drug scandals in the sport, will be disappointed: the book makes no mention of cycling’s doping controversies, past or present. But some less-than-savory stories do emerge, including the disintegration of the Dallas-based EDS track team and the discovery that the team manager had embezzled $1 million in funds. 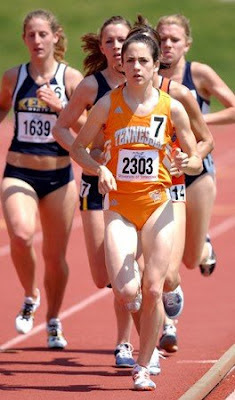 Most of the drama that Nothstein describes, however, takes place as competition on the track. This is the beauty of writing, of remembered history, of shared experience – you were there, with Marty, briefly you were Marty, when he endured the injuries and high-speed crashes and grueling workouts, when he rode his heart out in the semifinal and final rounds in Sydney against the best in the world, when he picked up his 5-year-old son and took a victory lap around the track after achieving, at last, the dream of gold. 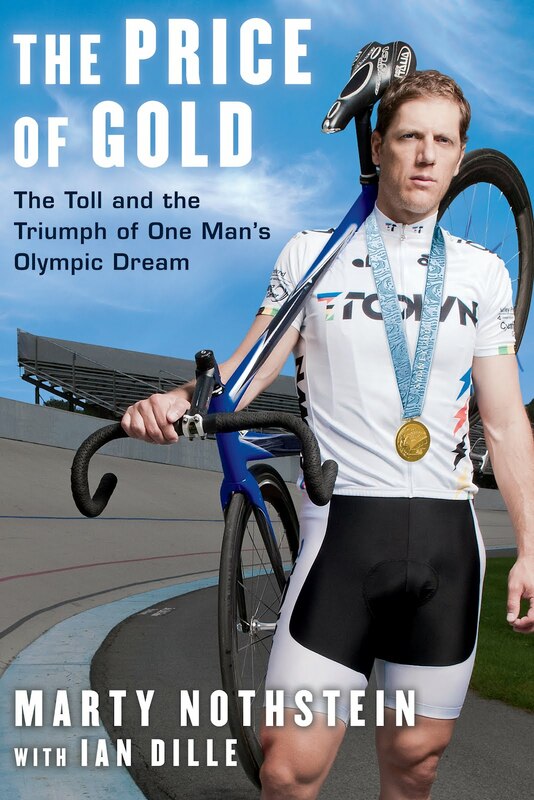 Attend The Price of Gold Launch Party at Bicycle Sport Shop on Wednesday, Aug. 1, 6-8 p.m. Reading and signing by Ian Dille, plus complimentary beer and appetizers. RSVP here. Now with a sprint distance! 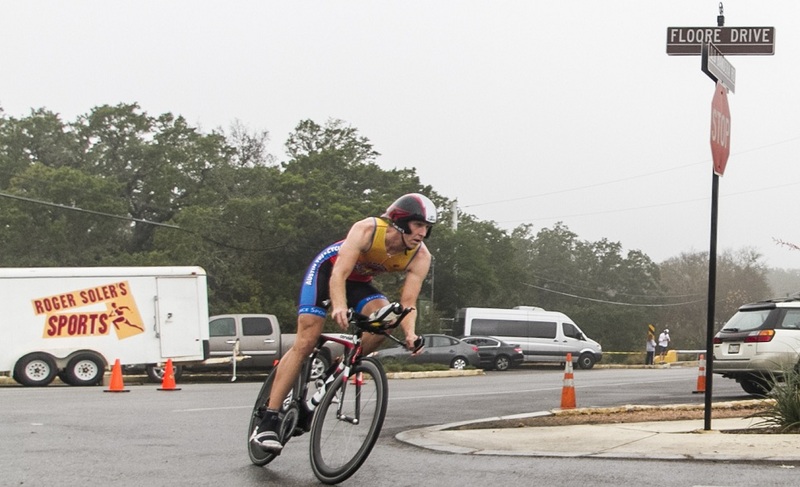 The Marble Falls Triathlon has always been a favorite event for Texans, well known for its laid-back atmosphere and beautiful, challenging bike course. The race offers a unique distance that is just a bit short of the standard Olympic distance, with a 1K swim, 23-mile bike, and 4.4-mile run. This year for the first time a sprint distance option was also offered, with a 500m swim, 12-mile bike, and 2-mile run. 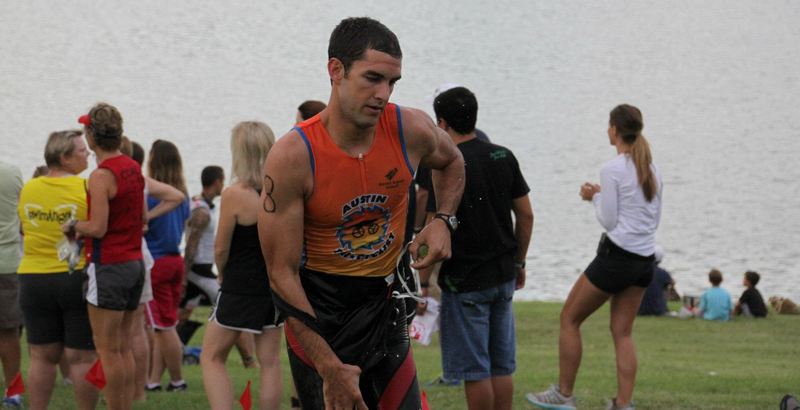 The race starts in Lakeside Park, and the swim is held in Lake Marble Falls. 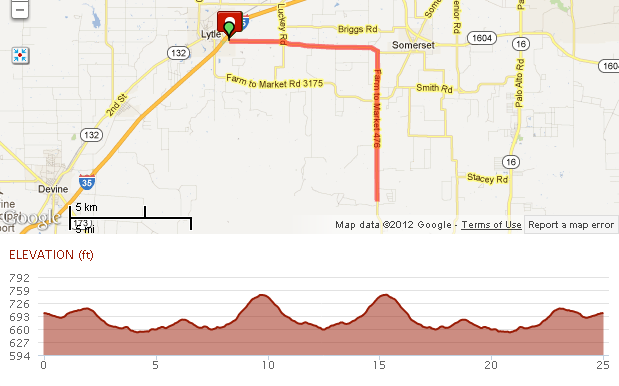 The bike course winds up and out of the park and then goes straight uphill and out of town for about 5 miles. Sprint athletes turn around at the top and fly straight back down, while the full course athletes head up Hwy 71 for a few miles of rolling hills before returning. 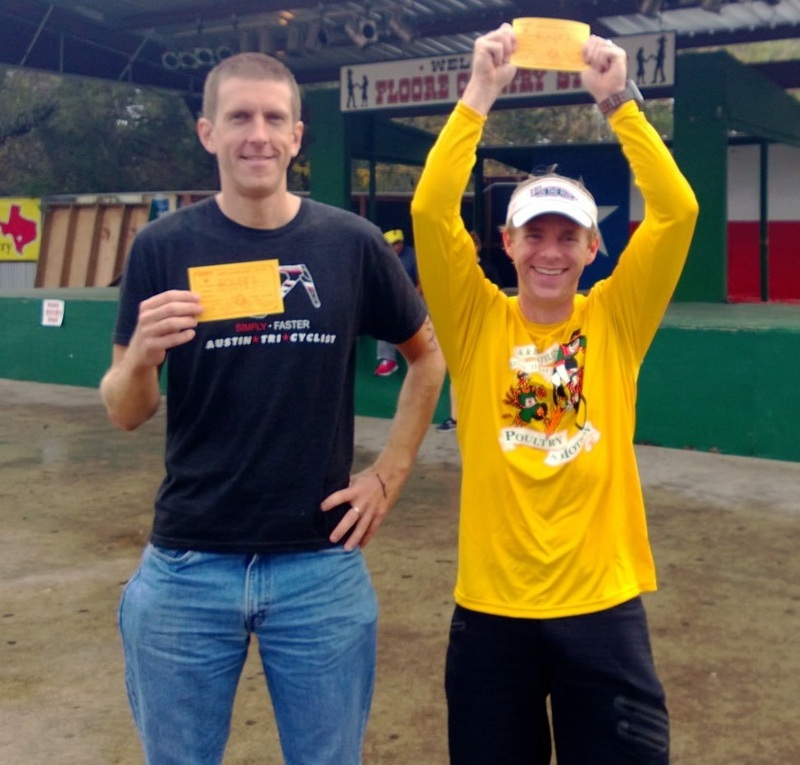 The run course then winds through Marble Falls City Park and the surrounding neighborhood, with a short, steep uphill climb to the finish line, just to punish you one last time. ATC had a large contingent of groupies and their friends at the race this year, with successful performances by all. George Schmitz started off his race with a 17-minute swim, aided by a fancy swim skin (see him tearing it off in the title picture). 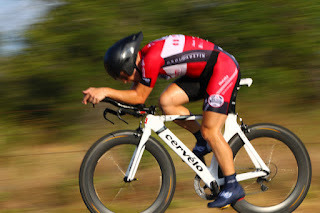 He was 2nd fastest in his age group, but he quickly took the lead by throwing down the fastest bike split in his category on his Cervelo P4 at 22.5 mph. Backed up by quick transitions and an ITU-style flying bike dismount, he was able to hold off the chasers on the run and finish 1st in the 20-24 age group and 9th fastest man of the day. 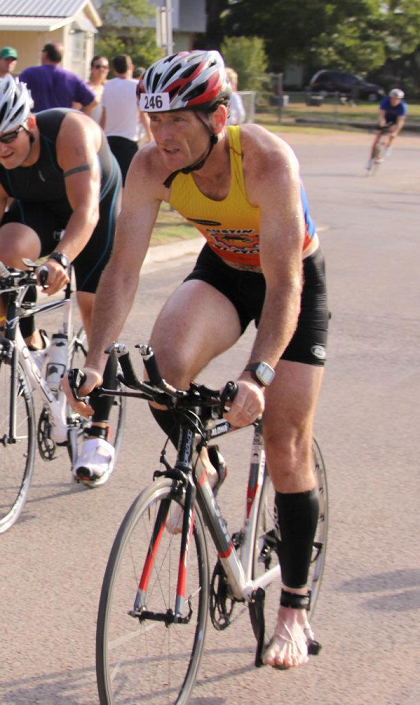 ATC regular John Trowbridge put on a clinic in the 45-49 age group. Fastest age group swim split, fastest T1 time, fastest bike split, fastest T2 time, fastest run, and of course the age-group win. 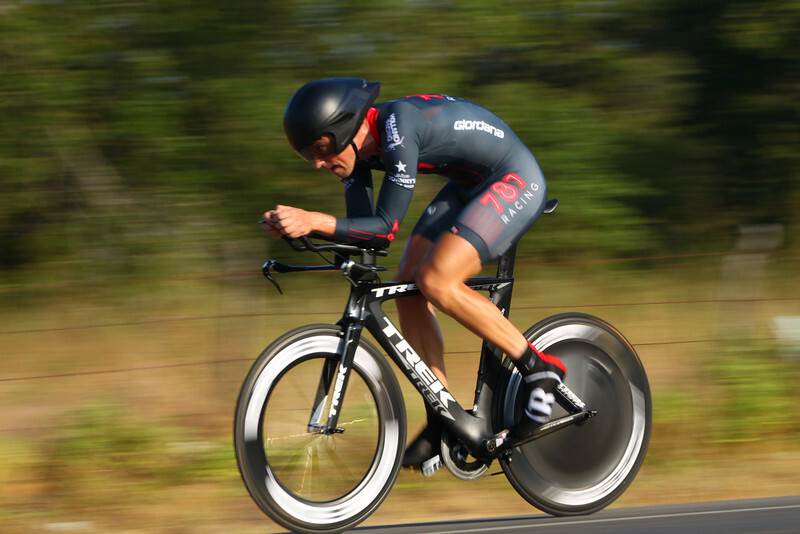 His overall time was the 4th fastest in the entire event as well, without a Cervelo or an aero helmet. A truly studly performance, with no weaknesses! 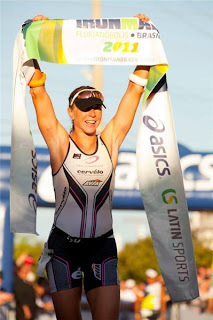 Marla has been splitting her time as a triathlete and bike racer this year. She has been sighted in recent weeks gunning for the podium at the Driveway Series crits, but that hasn't stopped her from running and swimming too. Marla started off with a decent swim, beginning the bike in 5th place in the 35-39 age group. 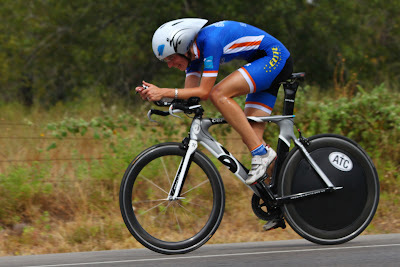 She then put her bike racing skills to use by powering herself back into the lead on her trusty Cervelo P3 with a 20.8 mph average speed, quickest in her category. Sadly, Mary Green, who had led out of the water, was able to get back into the lead on the run, but Marla hung on tough for 2nd place. On the podium again! 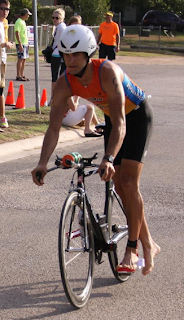 Kent Snead, occasional bike racer and occasional triathlete, was the only one among us brave enough to try the shorter, more intense sprint distance. Kent had no expectations, but we expected great things. He had also been seen on Driveway Series crit podiums in recent weeks, so if nothing else, he would surely bike fast. Kent started out with a decent swim, and then crushed the bike course on his Cervelo P2 with the 2nd fastest time of the entire sprint event at 23.9 mph. This, despite losing his chain in the closing meters and having to coast in full Dave-Zabriske-aero-tuck all the way down to transition. Kent followed that up with a solid run to take the Masters overall win! Gray Skinner came to Marble Falls as part of his preparation for the 2012 Savageman Triathlon. 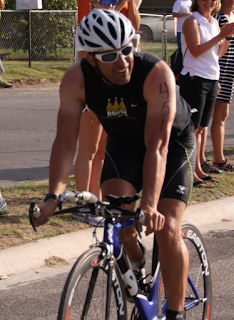 An accomplished cyclist, this would be his first triathlon in years. The swim, his weakest event, went relatively well, completed in about 18 minutes. He then stormed through the 23-mile bike course at an average speed of 25.6 mph, finishing the bike course minutes faster than anyone else at the event. His bike weapon of choice was his old-school aluminum Cervleo P3. He followed this up with some 6-minute miles on the run to take the age group win and 3rd fastest time overall. 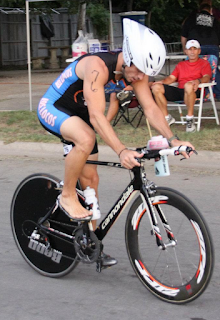 Dustin is half of one of the most fearsome husband-and-wife tri duos in Texas, the other half being last year's overall female winner Maggi Finley. This year, however, his wife was away, leaving him to race alone. But this didn't stop him from dominating the swim, posting the fastest split in the always competitive 40-44 age group. He followed this up with a 21.6 mph bike split on his Cannondale Slice, 4th fastest in his category. Dustin was troubled by a strange rattling sound during the bike, which turned out to be a loose cassette! Fortunately it stayed on and allowed him to shift for the duration of the race. Dustin then charged through the run course with some 7-minute miles to post the 3rd quickest run split and get himself onto the age group podium in 3rd place. 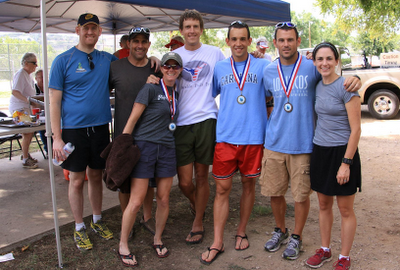 On a whim, we were able to assemble the most fearsome relay team in the history of Marble Falls (as far as you know). James Davison, ex division 1 swimmer and coach would start us off in the water, followed by myself (Jack Mott), ex division 1 video gamer, on the bike, and ex division 1 runner and coach Leah Soro Skinner on the run. Our goals were loftier than merely winning the relay category. More importantly, we wanted to help Leah score a victory over her husband Gray. We got off to a good start, with James making it through the swim in 16 minutes. 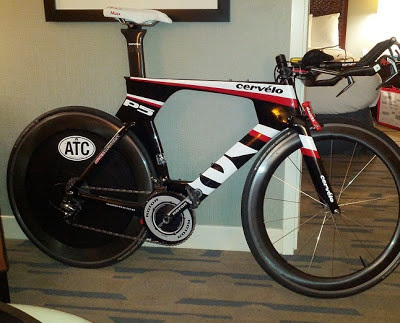 He ran up to transition and handed me the chip, and I grabbed my Cervelo P3 and was off. I kept the power high up the 5-mile climb to the highway, knowing that if I blew up a bit early, it would be no problem, I didn't have to run and the last 5 miles would be downhill! I felt like I was using cheat codes on the bike course. With no swim before, or run after, I was flying past people like I was actually good at this. I even had time to give Marla a little slap on the rear as I went by on the climb. (Fortunately, she laughed!) On the way back to transition I flew through the turns fast enough to worry the volunteers, but made it safe to T2 with a 57-minute bike split, 5th fastest of the day. Leah grabbed the chip and took off onto the run course with some sub 7-minute miles to bring home the relay win! We failed in our most important mission, however - Gray Skinner had 30 seconds on us. 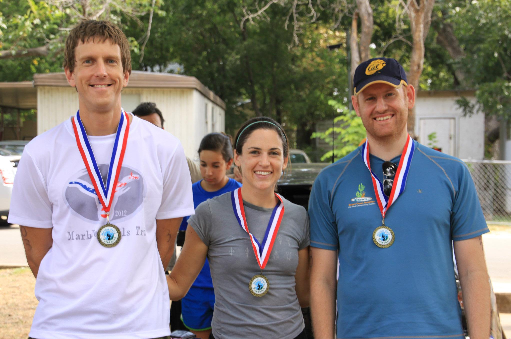 The overall winners of the 2012 Marble Falls Triathlon were Austin's own Jamie Cleveland and Andrea Fisher, the other most fearsome husband-and-wife triathlon duo in the state. Congratulations to them both! 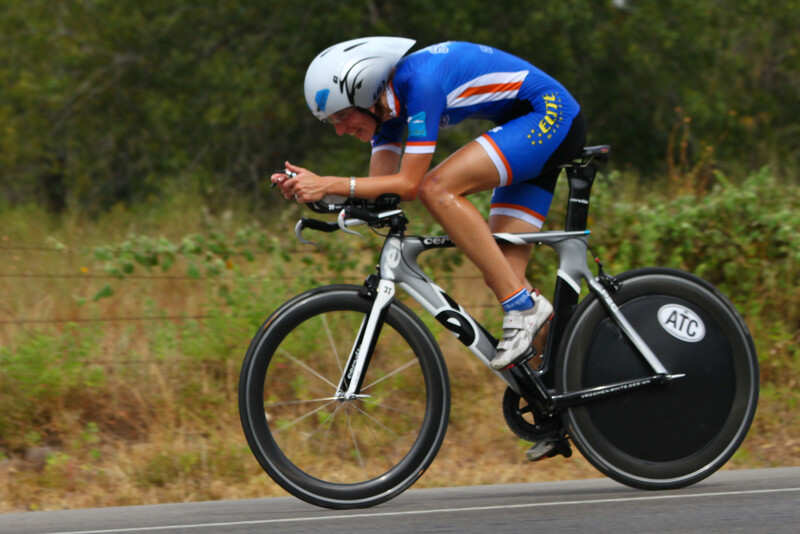 Austin Tri-Cyclist Summer Deals are HERE. From now until July 31st or while supplies last take advatange of these HOT bargains. Stop by the shop or use the code "summer2012" on our online store. 20% OFF Continental Gatorskin Tires - Stop Flats! Even 2012 bikes are marked down to make room for the 2013 models. Check out the full carbon Cannondale Slice Tri bike for $1895 or the Supersix for $1695. Want to keep up on the latest bargains and news? This past weekend was the annual Texas State Time Trial Championship. 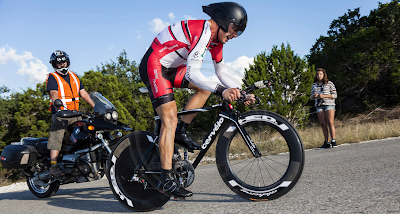 Hosted the last two years in Lytle, Texas near San Antonio, it features a 40 kilometer out and back course with rolling hills and smooth pavement. Each year the fastest athletes in the state test their time trial skills and aero equipment in hopes of winning a coveted state championship jersey, and cash prizes of course. Kickstand Racing, who has been running the event of late, has paralympic categories, multisport categories, and an Eddy Merckx (non aero) category along with the usual roadie categories. The multisport category makes the event perfect for triathletes to test their bike skills and win some money in the process. 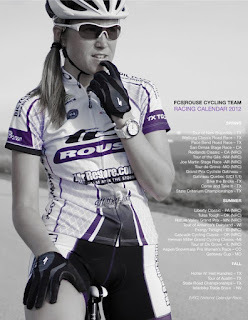 It is also a great way to check out the positions and equipment of the roadie studs, which can often be instructive for new triathletes. 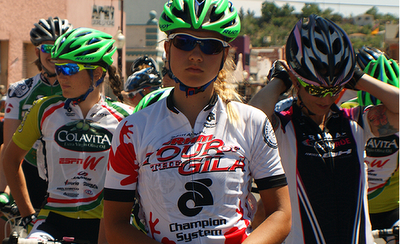 Riders are sent off at 30 seconds intervals, grouped by category. Drafting is not allowed. The course is rather simple with no technical turns other than the turnaround at half way. It is open to traffic but there is a sizable shoulder the entire length of the course. 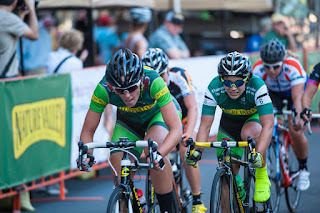 Saturday features all of the individual categories, while Sunday hosts team time trial competitions, where teams of 3 or 4 must carefully work together to go even faster. The weather this year was hot, as usual, and a bit windy which is also the norm in central Texas. In the Category 1 men ranks, the favorites were 787 Racing's Brant Speed and Super Squadra's David Wenger who were 3rd and 5th respectively at Nationals just a few weeks before. As the Cat 1 men were finishing it became clear that the course was almost a kilometer too long. In the end Brant Speed came away with the win, with an average speed of nearly 30 miles per hour and a full minute ahead of 2nd place Logan Hutchings. David Wenger would end up fourth. Browsing through the pictures of the competitors a clear pattern emerges. The people going fast are talented, and hard working, and they extend that hard work into their position on the bike. They have spent time figuring out how to get low and powerful, and even focus on how they hold their head through the course. In the time trial, the wind and your pain are the only enemies, and they must both be conquered. 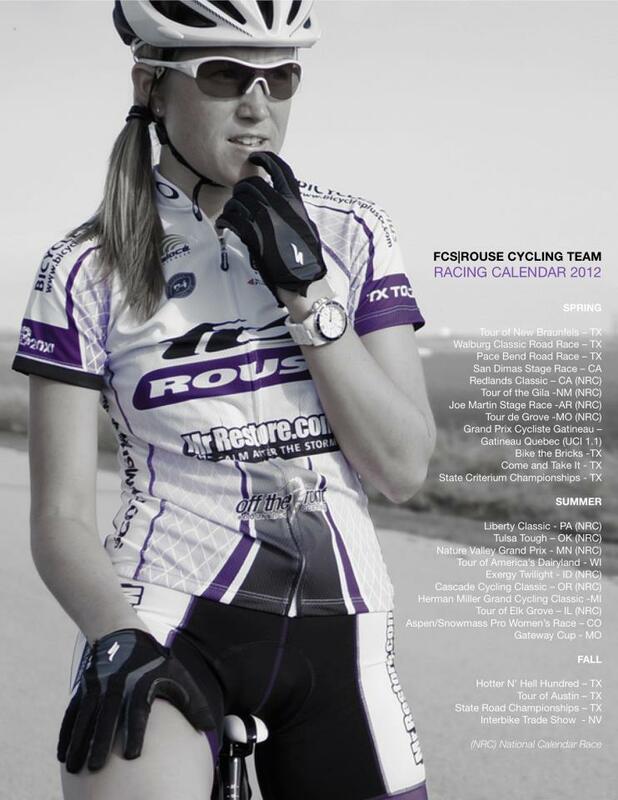 Triathletes can learn a lot by watching the top road cyclists in a TT. On Sunday one of the more fascinating cycling disciplines takes place with the team time trials. These contests are fascinating due to their complexity and the high speeds that are achieved. Teammates fly along the road at over 30mph, wheels just inches from one another, hands in the aero bars away from the brake levers. Perfecting the timing of when each teammate should pull requires thought and practice. The top teams are ones with great athletes who have also put in the time to practice. In the men's top category, team Think Finance took the victory. They were the only top team present at the Mineral Wells team time trial a couple weeks before, and their dedication was rewarded with a state championship. 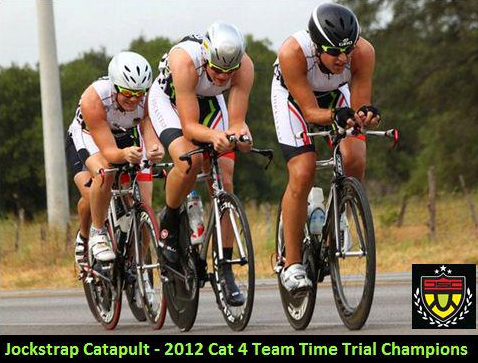 In the men's category 4, a victory for the triathletes as team Jockstrap Catapult of Houston narrowly bested team Ghisallo by 14 seconds with a 54 minute effort. Team Ghisallo did avenge this shame with overall wins in both the Category 4 and Eddy Merckx individual categories by Matt "Baby Jan" DeMartino and Adam Butler respectively. In the most important race of all, the Category 4 Slowtwitch bragging rights contest, your author, Jack Mott, bested Charlie Buser by over 2 minutes in route to breaking the hour barrier for the first time, but still slower than his own wife.